I have been lost from here for some time. However, I can assure you I have been cooking lots and have much to share about my experimentation and I will in the coming weeks. This week I have been feeling reminiscent of good times especially the other night when I prepared this. I remember the first time I made a version of this. I had just spent a day at the Southbank in London with my best friend where we had an argument. It was about something stupid, but we were both in a bad mood when we came back home which wasn’t helpful because earlier in the day we had asked some friends to come over later that evening for an impromptu dinner. I had planned to cook something; there were some racks of lamb that I had marinated the night before in some spices, a chicken and some vegetables…a roast of sorts was on the cards. When we walked in I got straight into the kitchen so that I could just concentrate on the cooking of the meal rather than continue with our argument while my friend went to the lounge to tidy up. It was surprising how quickly things fell into place with virtually no planning. I am not the kind of cook that likes to rush things and I love to cook spontaneously with whatever is available to feed my love of experimentation. My favourite time is to cook with people in the kitchen: cooking, talking, drinking at a slow pace so as to enjoy the whole process. However, saying that, I can certainly also be efficient when needs be and that day I was efficient beyond words! The meal went down a storm, much laughter and good times were had by all. And not to forget a recipe to remember because you see, just a chicken soup is good for the soul and the body, roast chicken does wonders for friendships. I have changed the original recipe slightly with the addition of Feta, some pearl barley and sultanas. I love the saltiness of Feta that contrasts beautifully with the sultanas (which I used because I was out of apricots and I think I prefer.) The pearl barley adds a delicious nuttiness and variation in texture. 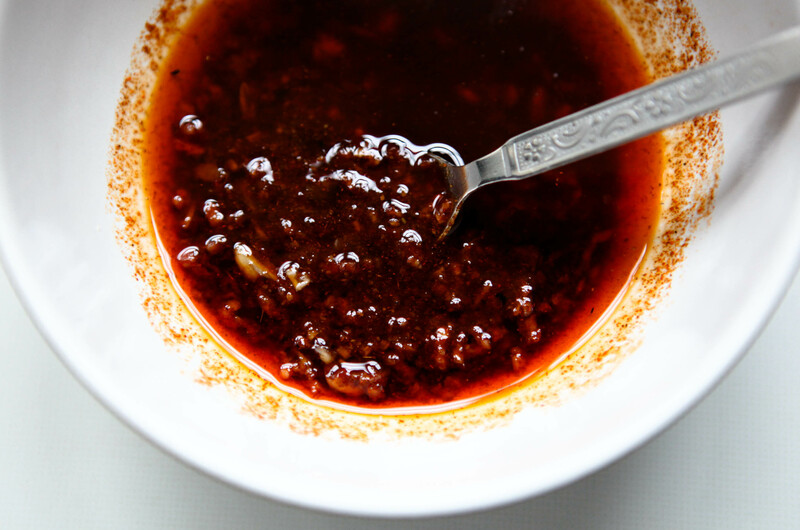 1 tsp roasted ground cumin (pan roasting the seeds before grinding yourself transforms this aromatic spice into a deep seductively smoky sweeter version than if you don’t- totally worth the extra step. It also adds to the richness of the colour. 2-3 tsp sumac (more or less to your taste and depending on the strength. If you can’t find this add a few more squeezes of lemon and 1/2 tsp more paprika) The reasons I use this instead of just lemon are twofold: It adds the sourness that lemon provides, but also an earthiness. Secondly, the speckles of sumac stain wherever they lie with a ting of rich burgundy that looks beautiful. Boil the peal barley in some salted water until done. If you omit this, you will still have sufficient stuffing without or for a large chicken soak a little extra couscous (25g). Place the barley couscous in a bowl, pour over 150 mls of boiling water and cover with a plate for 4-5 mins (or per the instructions on the pack). If you cannot find barley couscous, the regular wheat kind is absolutely fine. 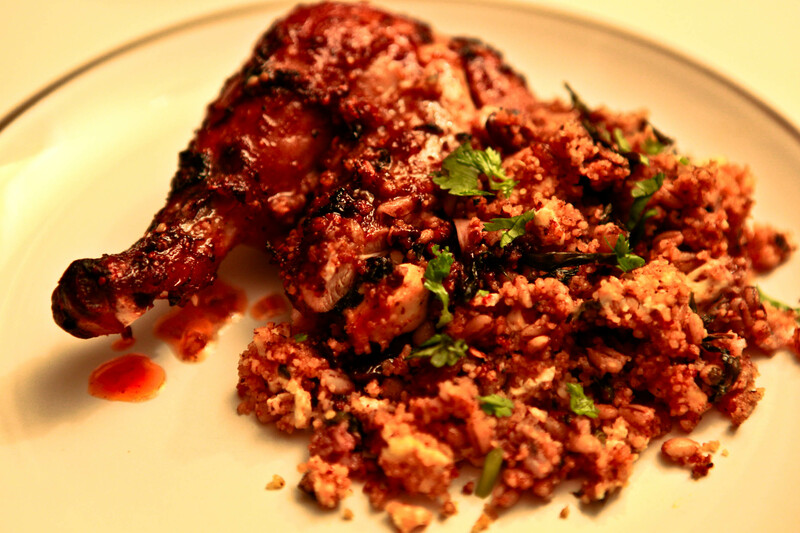 You could also experiment and try out Israeli jumbo couscous too. Fork through the couscous add the olive oil and cooked pearl barley and mix well. Now add all the spices- the chili flakes, paprika, ground roasted cumin, sumac and some salt and pepper. 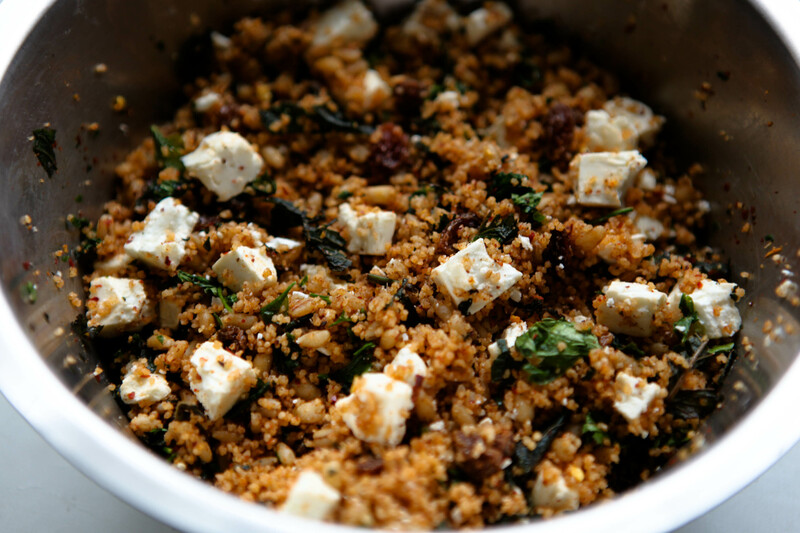 When adding the salt, bear in mind the saltiness of the feta you are using. Next add the parsley, mint, sultanas, and feta; stir to combine. Finally, sprinkle with the juice of half a lemon and taste- check the salt and balance of sour from the sumac and or lemon. Adjust according to your taste. Set aside while you prepare the chicken. When I do a traditional roast chicken, I will remove some excess fat, but I will leave the skin in tact because an English roast would not be the same without! However, in the Indian culture the skin is never left on on when cooking chicken. The reason for this is more on the lines of better flavour penetration than for care of health! The skin, although tasty when crisp and useful to prevent drying out when being fried or roasted, it doesn’t allow for the aromatics to really get into the flesh. There is rarely a time that I will not add garlic to a roast chicken; even when preparing a traditional roast. On these occasions when I want the skin in tact, I will lift the skin on the breasts with the back end of a spoon in order not to pierce the skin and then leave my fingers to gently loosen the skin from the flesh to provide a pocket to put my marinade of choice inside to ensure the flavours get into the flesh. The skin on the rest of the bird is left as it is because I will stab cuts in the joints to allow for flavour penetration. Another reason why the skin is discarded is that Indians don’t see the flavour of chicken coming from it’s fat or skin as is the case in a lot of other cuisines. For them, the flavour comes from the bone hence why the majority of South Asian meat and poultry dishes are cooked on the bone. Although some of the time Indian meat and poultry dishes can be rich due to the addition of cream and or butter, the removal of the chicken fat and skin and excess animal fat on meat gives Indian dishes a much “cleaner” flavour and allows for the aromatics to shine through. A couple of exceptions to this rule are when I cook duck or goose. Almost never without the skin or fat. That would be sacrilege! Unless I want the skin for a purpose I de-skin chicken- the whole and pieces. It’s very easy to do. All you need is some strong kitchen paper to grip onto the skin, a knife, scissors and a little strength! The breasts and legs are pretty easy..the wings and the underside can be a little tough sometimes and so if that the case, get a knife and or scissors to help you with the underpart and leave the bits of the wings you can’t get. Of course if you are buying your bird from a butcher, they will do this for you and if you happen to go to an Indian or Pakistani butcher the chicken will be skinless anyway! All my Indian, Middle Eastern and Far Eastern dishes with chicken are done this way for the flavours to really get into the flesh; not to mention it’s healthier. As long as you cook the bird at the right temperature (I recommend between 160-170C depending on your oven) and baste once or twice you will not suffer from a dry bird. Place the de-skinned chicken onto a baking tray covered with foil (I purely put the foil down for ease of cleaning). Take a knife and make some stab cuts into the thick part of the thigh area and also around the underside of the wing area. Avoid the breast meat. Now take some pepper and about 1 1/2 tsp (or to your taste) of your salt of choice- try a good flaky sea salt like Maldon and rub all over the chicken massaging it into the crevices. Next take the marinade for the chicken and slather that all over the chicken getting into all the nooks and crannys including the opening of the cavity. 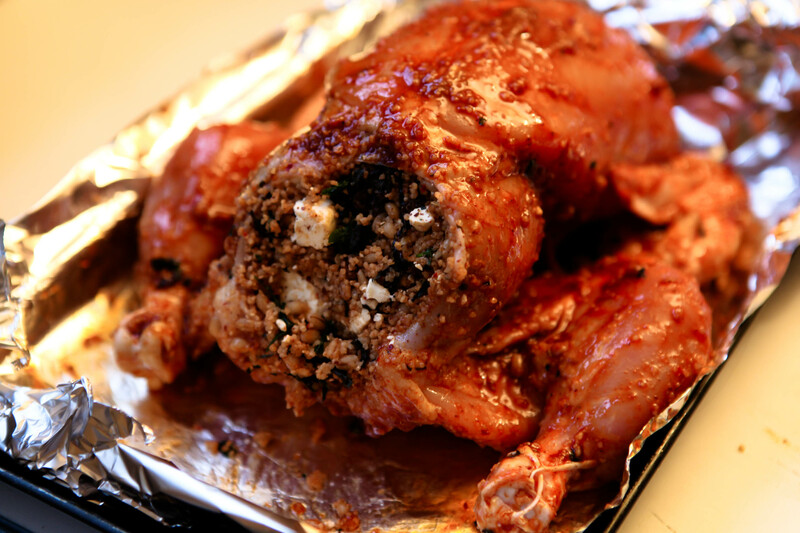 With your hands hold the chicken with a firm grip (it may help to hold it upright with the cavity pointing upwards) and pack the stuffing tightly into the cavity a spoon at a time. Don’t forget you can get some in from the neck end too.. you’ll be surprise and grateful about how much you can pack in because the stuffing is a sponge for all the deliciously savoury chicken juices while its cooking! Depending on the size of your chicken- you may have some left over. I managed to get all the stuffing into a medium/large 2.5kg chicken. If you have any stuffing left over (provided you haven’t contaminated it with raw chicken-y hands or utensils you can keep it to serve with the chicken when it’s done- If I have a smaller chicken, I keep about a cup of stuffing on the side and add it if needed- that way there is no risk of contamination! Finally put the chicken in the oven for about 1-1/1/2 hrs depending on the size of your chicken and your oven. This 2.5 kg bird took about 1 hr 15 mins. Baste it once or twice during cooking by tilting the tray slightly and spoon over the juices. It’s done when you poke a knife into the thickest part of the thigh and the thick part underneath where the wing joint is and the juices run clear. In the spring and summer enjoy this with a mixed green leaf and herb salad lightly dressed with a simple seasoned olive oil, lemon and sumac (if you have it) dressing. In the autumn and winter this dish is perfect with a selection of roasted root vegetables drizzled in some olive oil, seasoned with a light sprinkling of ground roasted cumin, chilli flakes and flaked sea salt to taste. When they come out of the oven bring them to life with a few squeezes of fresh lemon juice.